A recent bit of information from the NY AIA awards, announcing one of the winning entries for 2008. 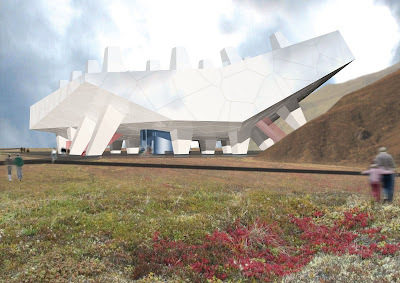 The 'World Mammoth and Permafrost Museum' in Yakutsk, Siberia, which was a first-prize winner in a 2007 competition, is a project that definitely posed some challenges in site and program. The result ended up with an interesting folded form and strikingly subtle landscape. It is really compelling in site design for melding into one of the most delicate microclimates on earth. Add while I do love a good architectural award - the landscape and building interaction on this project is pretty amazing in this example. Designed by Balmori Associates (and L+U favorite), with Leeser Architecture, and a team including Arup, Atelier 10, RWDI, and Tillett Lighting Design - the project was awarded a AIA New York Chapter Design Award Project Honor in 2008. From Balmori's press release: "We developed a permafrost landscape to respond to its context. This integration of nature and structure provided the twist that ultimately helped to tell one story by landscape and building." I love the graphics on the existing site and site plan - which are appropriate and evocative of the steppe landscape... abstracting but capturing perfectly the nuance of the terrain. This cellular form continues in Leeser's building and seems to fit as well, but it's difficult to see exactly the specific material in these renderings, which are definitely site-centric. Some additional info on the project, via Core.form-ULA: "The Museum, its Scientific Research Center and Laboratory were established to study not only Siberian mammoths, but also Yakutsk’s Permafrost layer: a condition that makes the ground surface prone frost heave. With each freezing and thawing cycle, soil and stones shift into self organizing patterns and creates a unique condition known only to that region. 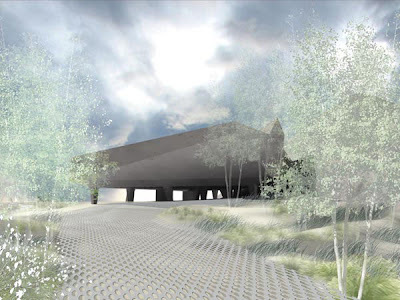 Balmori Associates developed the plan of making a permafrost landscape, and letting this respond and be derived from its context. This integration of interface between structure and nature, the trademark of Balmori Associates, provided the twist that ultimately helped the project to win." The interior and exterior views frame and complement the semi-barren Siberia landscape and require subtle interventions, and can be strongly accentuated with the lightest touch. The image above shows some simple paving with minimal articulation from multi-trunked aspens and a waving ground plane of grasses and simple wildflowers. Similar to a tallgrass prairie, there is simplicity in overall form, with broad brushstrokes of color, but when viewed up close, opens up with subtle and vibrant colors and textures. To capture this is hard. To design with this is near impossible. There is some more space in the interiors for a bit of stylistic flourish (who says science can't be beautiful?) 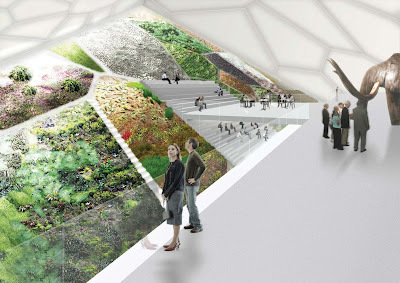 Again, via Core.form-ULA: "The interior of the museum is covered with gardens that cascade down a sloped surface and help to create an healthy indoor climate. Lush mats of moss and lichen, the natural insulators of permafrost ground grow between latticework of pathways. 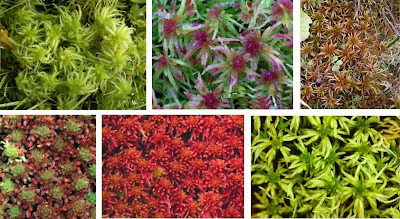 Each moss and lichen requires different growing substrates (stone, wood, gravel, etc.) which present an opportunity for sculptural design. Based on patterned ground formations that occur above permafrost, the landscape design is both aesthetically and ecologically reminiscent of the local natural patterns.. All plants chosen are native to Eastern Siberia and are showcased as well in the extensive outdoor gardens." A bit of digging found some more architectural shots from building interiors, which frankly seem a bit clinical (oh, it's the non-fun part of science, right?). The subtlety of the landscape may seem more vibrant when interiors are spare and devoid of color - as the outdoors are glimpsed through corridors at a distance. Perhaps the beauty of contrast. All in all a great project and some fine site/building integration. 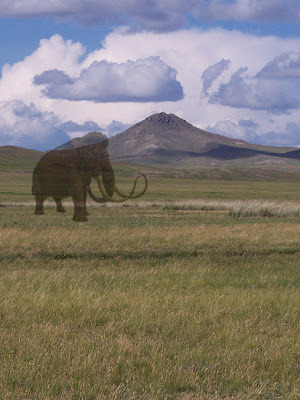 Too bad the mammoths aren't around to enjoy this place that has been created for them, although there is, according to Dezeen: "The centre will contain an intact mammoth discovered nearby and provide access to underground galleries from which the permafrost can be viewed." I've been a fan of Balmori Associates since my first glimpse of the green roofs in Long Island (recently included in a review of Site/Non-site) and the appreciation of their work in the urban landscape. This project reinforces this idea, with a delicate site design that is as appropriate to a difficult and amazing context. A short bio, gives some more info as to why they fit the idea of Landscape+Urbanism - perhaps a future profile in Veg.itect series is imminent. Via Core.form-ULA: "Balmori Associates, founded in 1990, is a design firm recognized for its work in integrating architecture, urban planning and landscape architecture into complex urban projects. 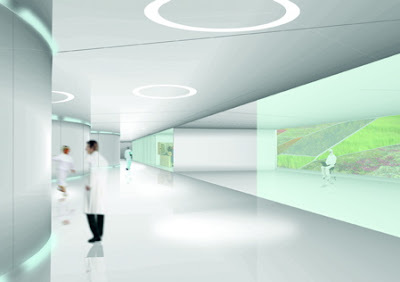 The firm seeks to incorporate innovative sustainable systems and patterns of use within an overarching sense of place. Balmori Associates combines a high level of artistic design with a deep understanding of ecological principles." Thanks to Monica and Christina from Balmori for the tip and photos!